What is Home if it is not Here? What happened today? I knew that I was struggling with physical manifestations, deep in the experience of the lack of control I had over my own body. The digestive re-patterning, as my friend Paula called it, a severe understatement. The re-occurrence of the little sores I have battled since the late years of Ken’s illness … those that make me wonder if I will ever be whole again, whole in the way our world looks at a woman. Recognizing how big a role Ken and his leaving his body, played into that sense of wholeness, holy-ness. So frustrated with the sores, the digestive volcanic eruptions, leaving soreness deep in the bowels, skin-deep, bowels-deep. Who is it that wants to know the truth? Who is it that is willing to do, feel, experience anything? What is the motivation? Is it to truly know God or to truly know God to fix the sores, change the digestion, get outta HERE? Been trying to get out of here all my life, through relationship, through not caring, through my children, through work (God I was a workaholic), through my sailboat trip around the world that only made it to Mexico. Been trying to get out of HERE. Such anger spilled forth, such anger at God … How could You? Such sadness, such pain and angst … I just want to go HOME. Please. Where is Home if it is not Here? The Truth of a Higher Ideal exists because awareness of it exists. The possibility of manifesting Christ Consciousness is real, for It has shown Itself as Real. And yet, if I reach for it in anyway, there is an ‘I’ and ‘It’. 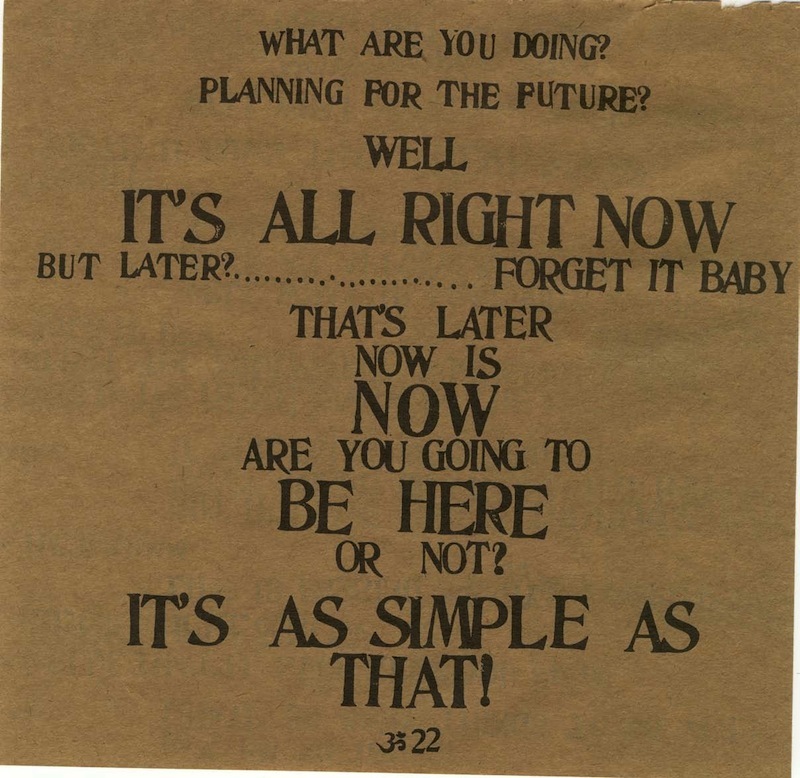 Feels like the book title by Ram Dass is all that remains – BE HERE NOW. It could simply be any or all three words. They all mean the same thing. Maybe that was his trinity, his Tri-Unity of Truth. Why Be Here Now? To get somewhere? No. Been beating my head both noisily and ever so subtly against that one. And I may yet again. That is yet to be seen. What is not yet to be seen is the fact that there is no joy there. It appears to work. Stay still and life improves. The ‘I’ co-opts this understanding so skillfully, so quickly. Not resisting is not being an ‘I’ with a thing. It is simply being here now. The moment resistance arises, there arises the existence of an ‘I’. What a teaching tool. One of God’s finest inventions. So why Be Here Now? What’s the point? Because it is the Truth. It is what is Real. It is all there Is. And also, in what seems a paradox, awareness of the Higher Ideal, its truth, its potential, its possibility exists. It too is Here Now. It too is unfolding, evolving, expanding consciousness. If I reach for it I move out of Now, creating the ‘I’ in the movement. What’s left is Trust, trust in the Higher Ideal and the perfection of Its unfolding. Being close to home, here with sores and an erupting belly, smack in the middle of Now feels just perfect. This entry was posted in Awakening, Awareness, Community, Death, enlightenment, Healing, Honesty, illusion, judgment, New reality, Present Moment, remembrance, the lie, Truth and tagged be here now, christ consciousness, higher ideal, ram dass, real, reality, truth. Bookmark the permalink. Love this Anrael. Nice add. Really nice.